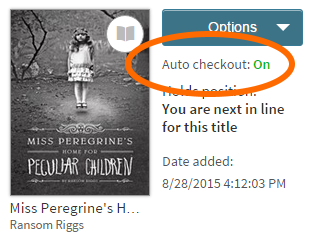 What is automatic checkout and how do I turn it on or off? By default, your holds will be automatically borrowed and added to your Loans page (under ) as soon as they're available. You'll receive an email notification when this happens. If you'd like to turn off automatic hold checkout, follow the steps below. On your library's OverDrive website, click or tap , then select Settings. You'll need to be signed into the site to get to this page. Under "General," deselect Automatic hold checkout. Your setting will be saved automatically. If you turn off automatic hold checkout, you'll receive email notifications when available holds are ready for you to borrow (from your Holds page). All holds, including those you've already placed, are affected by this setting. Select Place a Hold to place an unavailable title on hold. 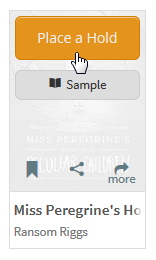 On the page that opens, make sure that Automatically borrow this title when it becomes available is selected. Note: Automatic borrowing cannot be turned off for some titles. In those cases, you will see a note on this page letting you know that the title will be automatically borrowed for you as soon as it's available. 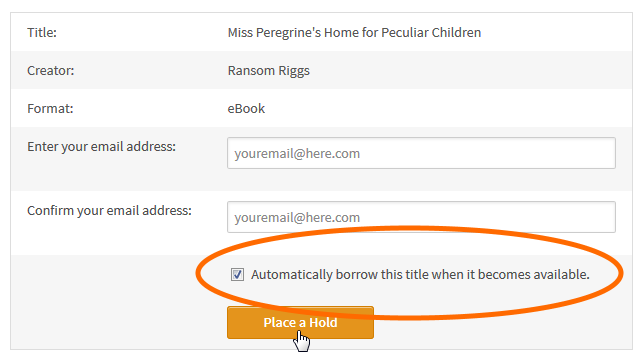 You can turn automatic borrowing on or off for most titles you've placed on hold by visiting your Holds page and selecting the word On or Off next to "Auto checkout." You will receive an email each time a hold is automatically borrowed for you. You can find these borrowed titles on your Checkouts page (under your Account).